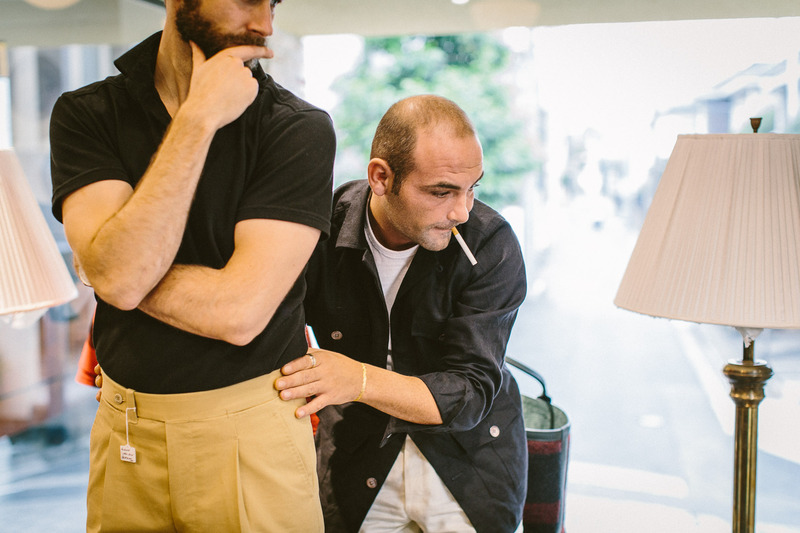 Last year, while in Japan at Bryceland's, Salvatore Ambrosi offered me two pairs of his new ready-to-wear trousers to try. Regular readers will remember that the bespoke trousers I had from Ambrosi the previous year suffered from consistency issues. The fit was often good, but there were persistent mistakes. Since then Salva has expanded into ready-to-wear, often with fit adjustments available. 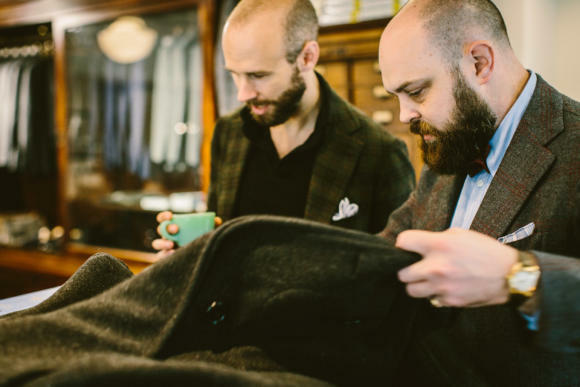 The trousers vary between different stockists: Bryceland's, The Armoury NY and The Armoury HK all have slightly different styles, for example. They're made to the same level as bespoke, so have a huge amount of hand detailing, tacks, pick stitching etc. That all makes them pretty pricey - around $800 at those three locations. Having liked the fit and style of Salva's trousers, despite the issues, I was interested to explore adjusted RTW as an alternative. I was also curious to see how things had changed - Salva had mentioned to me in passing that he was focusing more on order notes and production consistency. When we met in Japan, he had new order sheets on which to note all the various requests, and assiduously took everything down. Ethan (Newton, Bryceland's founder) has two specific styles: one higher waisted with two pleats, the other slightly lower waisted with a single pleat and a more extended waistband (pictured). I was particularly interested in the difference in rise in the former, which was much higher at the back than the front. Most tailors will try to have a similar rise at front and back, with the view that a horizontal waistband is more attractive and flattering. But I've often found that this can be at the expense of fit, and my bespoke trousers often end up being slightly higher at the back. Ethan (below) agreed that most trousers fit better with a higher back rise - although it is dependent on the physique of the customer. And it is more useful the higher the rise. I ordered one pair in each style - a tan cotton in the single pleat and a pale linen in the double pleat. The results were much more accurate than before. The length and waist were perfect, and all the details were correct. Indeed, one style point that I thought was wrong actually turned out to be correct - with Salva sending me a picture of the order form to prove it. But there was one issue with the fit on the cotton pair. The seat appeared to have been made smaller, not bigger, and as a result they were very tight - almost unwearably so. This is only one issue, but of course the problem with having trousers made in a foreign shop by a (differently) foreign tailor is that there is no immediate means of recourse. Salva doesn't currently do trunk shows in London. I'll likely wait until Pitti and give them back to him, though I could also have them adjusted locally. Aside from consistency, price might be an issue for Ambrosi RTW, as for $800 you could have good trousers made bespoke with the same level of workmanship. That said, the style and fit elsewhere was perfect, as before. Particularly nice touches were the extended waistband design and the gun-holster side adjustors on the linen pair. I'll post pictures of those as I wear them. 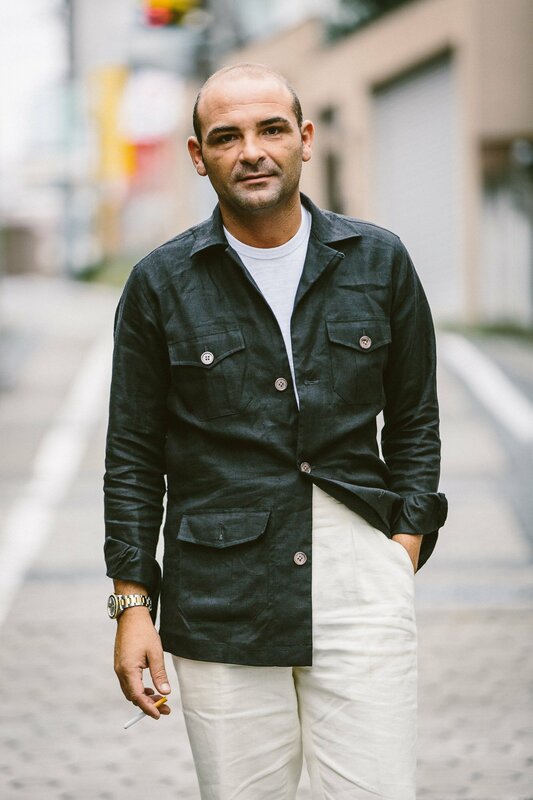 Salva, by the way, is wearing a beautiful black-linen overshirt from Bryceland's. You can follow the discussion on Ambrosi ready-to-wear trousers by entering your email address in the box below. You will then receive an email every time a new comment is added. These will also contain a link to a page where you can stop the alerts, and remove all of your related data from the site. Aside from speed and convenience, I can’t really understand why anyone would opt to purchase these trousers as opposed to having a pair made? And was it really necessary for him to smoke during the fitting?! Not sure I’d want to visit a tailor if I knew I was going to be coming away smelling like an ashtray. The cigarette does not appear to be lit. I can relate to having an unlit cigarette between my fingers or between my lips to satisfy my habit when not allowed to smoke for longer periods. This isn’t 1950; cigarettes are not some element of sprezzatura style. So my vote? Don’t show photos of people with cigarettes— this site should not, even if only subtly, be promoting/condoning something we now know kills people. What’s with the sanctimony? People are adults here and can do what they’d like. So long as the tailor asks if the client minds if he smokes, what’s the issue? And, being that we’re all adults, I’m sure we can make our own decisions with what we want to do with our bodies. He’d probably ask you if you mind before lighting up. As a customer of a tailor whose very small shop could fit three chain smoking worksman, I think this habit should be dealt in deliberate manner by the shop owner. My last garment (wool with some mohair) I made there reeked of cigarette smoke for the better part of the year, stinking up my closet along with it. This post is an interesting fllow up on the previous one indeed. Salva’s RTW seems to be a good alternative to his bespoke. For those who are not regular formal dressers but jacket wearers instead, these trousers would belong to special occasions outfits. One can imagine having one in light grey fresco for Summer, and one in light or mid-grey Fox Bros flannel for Winter. I wouldn’t go for cotton or linen. unless the first mentioned ones were already secured. What’s your preference as to pleated pants these days? In the past, you seem to have favored flat-fronts. I tried on a pair of these last week. I thought they were superb, the material is so thick they could almost stand up by themselves. I did baulk at the price, though. Simon, do you have a recommendation for reasonable value bespoke trousers? A&S start at 1500 I think. 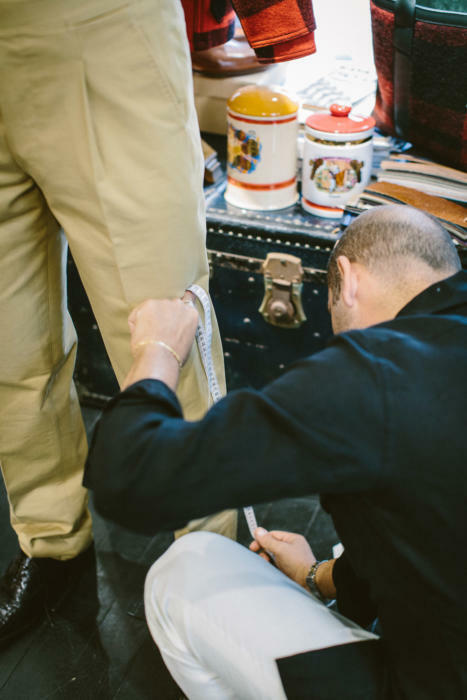 Having bespoke trousers rather than RTW is far more an issue of fit than anything else. Apart from 501s, I have never been able to find an off the peg trouser that come anywhere near to fitting. Fortunately I have a very talented alts guy, but there is a limit to the adjustment that can be made. So for me, casual off the peg normally makes sense, but anything else has to be tailored. Hi Simon, Do you have an opinion about Robin Pettersson/BnT trousers? He’s coming to London a few times a year, I think. Yes, I’ve been fitting a jacket and trousers with him over the past six months. The process has had a couple of issues so far, but we’ll see how it ends up. By current standarts, this price tag is not extraordinary at all! 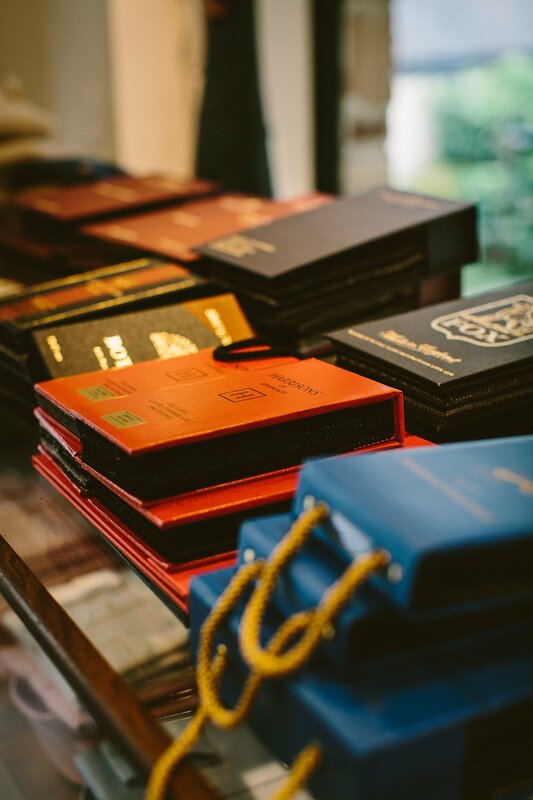 Just take a look at Mr Porter US. Where can one buy such linen overshirts besides Drake’s (their overshirts are oversized)? I was in Tokyo two weeks ago and went to Bryceland’s and met Ethan. Very cool store and they had just un-boxed your latest book. Ethan was very nice and we talked watches for a bit, thank you for introducing him via your blog! These smoking visuals are completely bizarre. If a tailor fitting me smoked I’d be out of the shop before he could thread his needle. Unless you have in mind to do a bespoke leather cover for a portable oxygen tank I’d exercise some discretion. Any publication that promotes this disgusting habit won’t have my patronage. I do not promote it. But I do not think it is my place to censure it either. It is a health and lifestyle issue and not the kind of thing I will address either way on a clothing site. I’m sorry Simon but defacto if you feature photographs of people smoking on a blog titled ‘Permanent Style’ then of course you are promoting it. Unless of course, somebody else chooses your visuals? This is ludicrous. I hadn’t noticed the cigarette until it was mentioned and unfortunately this confirms some of the misgivings I have about the bespoke world, namely that it’s full of people who are too precious by half. The permanent style would surely include such notable smokers as Winston Churchill, David Hockney and Serge Gainsbourg. If this kind of intolerance against smoking was bespoke-specific smokers could breathe again. And I wonder if anything one can do with his hands looks as permanently stylish as holding a cigarette, even an unlit on. So while the cigarette dominates the comments and the trousers the text, for me Mr. Ambrosi´s perfect safari shirt is stealing the show in the photos. What is that jacket you’re wearing in the fourth photo from the top? The green one? Lovely cloth. By chance would you have the reference? Hilariously amusing how many comment on smoking when the purpose of this article is about Ambrosi RTW trousers. Thanks for the post Simon as I have always been intrigued on Ambrosi RTW line. I have a few pairs and the speed and convenience is what I need because I travel a lot and I can rarely be in a place when needed for fittings. So it takes many months for me to do bespoke because I am guaranteed to miss fittings. And they fit me spot on. On the cigarette, Salva is a big smoker but never does it in front of customers. If he had a glass of vintage scotch in his hands would there be any complaints? Alcohol is addictive and kills many thousands of people every year- but the lobby has always susessfully fought off the demonization of its products. My point is don’t be so judgmental. We all have sins. 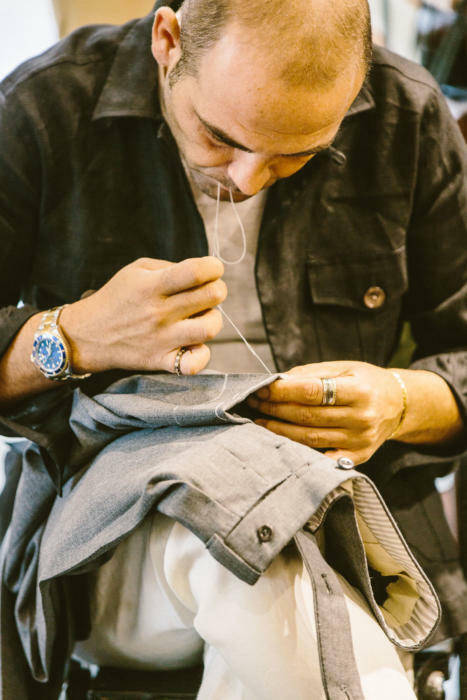 Having read a few of your articles on bespoke trousers(Cerrato) would you be so kind as to advise in your opinion which bespoke trousers(formal/casual) makers are the best in terms of fit and etc? It’s enlightening to hear your thoughts as having read your article I would not have known that Ambrosi has his flaws too!! (One always (wrongly) assumes that expensive=good! Lastly do you think a well known Asian house like WW Chan/Gordon Yao/A-Man Hing Cheong can compare with the European/Japanese bespoke trousers makers/tailors? Will be looking forward to your analysis! Of the specialist trouser makers, I’d go with Cerrato. And yes, price doesn’t always mean quality at all! A lot of the HK makers like those could do a decent fit and quality level, yes. Definitely worth exploring if you’re local. I’m interested in the cloth you pick for your single-pleated tan cotton trousers. Would you mind sharing a few details? To be honest, I wasn’t that pleased with how they turned out. I can’t remember the bunch, but not worth digging it up probably as I can’t recommend it! What weight do you recommend for a four-season cotton trousers? I find heavier weight (at least 13oz) to be more practical.